The custom two-piece curved adapter allows for mounting the Clement Focuser on an existing bolt pattern or replacing an existing focuser. One reason you might want this accessory is its very low profile adding as little as 1/4" to the overall height of the mounted Clement Focuser. 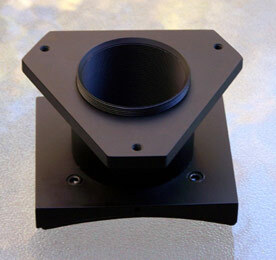 Also, since our focuser has an ultra-low profile of just 1", a riser can be added between the two-pieces [shown below] to allow for the use of the telescope's existing optical configuration. For example, the DL2006 with a two-piece curved adapter and 1.5" Riser was a bolt on replacement focuser on a Meade LXD55 Schmidt-Newtonian. To reinforce a thin tube when using a curved mounting adapter you may want the optional Inside Plate [shown below] with captured nylock nuts. The curved plate is 1/10" thick black satin anodized aircraft aluminum. 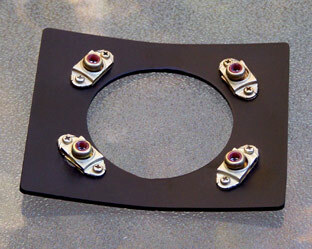 This plate is mounted on the inside sandwiching the tube between the curved mounting adapter and the inside plate [shown below right].